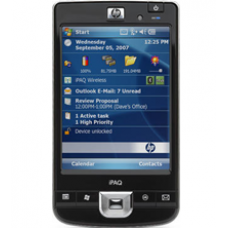 The HP iPAQ 214 Enterprise Handheld has the power to run your business applications and a broad range of third-party vertical solutions. It is an attractive alternative to other handheld platforms. With a large 4-inch touch screen and 802.11 b/g wireless networking, it delivers enterprise-class connectivity, so you can mobilize your business and maximize your results. * Integrated Bluetooth and WiFi Wireless Connectivity with Enhanced Data Rate with enables high-speed wireless access. * Features Microsoft Office Mobile 6 with Microsoft Software including Word, Excel, PowerPoint, Internet Explorer and Outlook. * Large 4-inch TFT touchscreen allows you can display your documents with improved visibility and clarity. For more details about our grading system for refurbished units, click here to view our handy guide. Do these come with the USB cable? Yes, the refurbished iPAQ 214's are provided with the official HP sync and charge USB lead.